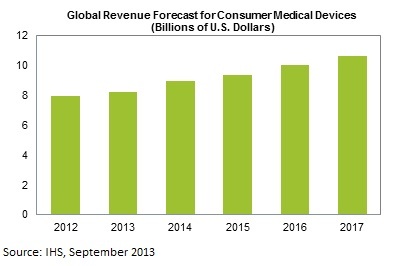 Market researcher IHS has forecasted the total worldwide market for consumer medical devices to grow by 4% to reach US dollar 8.2 billion by the end of 2013, compared to revenue of US dollars 7.9 billion in 2012. The top three products are hearing aids, blood glucose meter and blood pressure monitors, as per IHS. IHS has listed growth forecast in the below table. The fast-growing products according to IHS include activity monitors, body composition analyzers and heart-rate monitors. Region wise IHS finds Asia-Pacific is fast-growing, the Americas and the collective Europe-Middle East-Africa (EMEA) regions are also prominent centers of market activity. Among countries, Denmark and the U.K. have been especially successful in implementing telehealth, or the remote monitoring of health conditions via monitors and compatible devices, according to IHS. IHS finds blood pressure monitor device is an important contributor to the market with revenue this year of some $838 million, one-tenth of the overall takings projected in 2013 for consumer medical devices. The blood pressure monitor is predicted by IHS to reach revenue of more than $963 million in 2017. The report also points the rise in hypertension in emerging markets including India due to dietary changes influenced by rise in income, which is also adding to the growth of the market for blood pressure monitors. But the reality is, it is not dietary change, but is more of a bad food habits and heavy use of pesticide in agricultural products rather than increasing income, this is particularly true in India. In fact majority of people can not offer to buy fruits such as apples, and dry fruits due to increase in the prices of such vitamin and mineral rich fruits. People in India have shifted to drinking lemon tea instead of tea made with milk, due to the cost factor. Lemon Tea is healthier than milk mixed tea. The polluted and suddenly changing weather is a major cause of sickness in emerging markets.